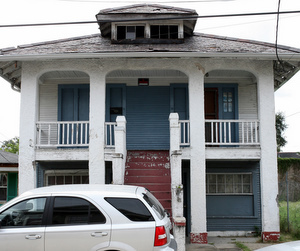 The Neighborhood Conservation District Committee will meet today to consider a number of demolition requests through Central City, Carrollton and Hollygrove neighborhoods. Uptown-area properties are listed below, based on research at the Preservation Resource Center’s Preservation in the Present blog, which includes a list of all properties on today’s NCDC agenda citywide. The FEMA designation, does that mean that FEMA is requesting the demos. I thought all that money was spent. Many of these homes are still listed in private names. Will the city bill the owner or what is going on money wise. Who is paying for these? Who gets the vacant lot? Rebeccca, technically the City of New Orleans is proposing to demolish the properties and FEMA is paying for the demolitions. The universe of “FEMA funded demolition” eligible properties has been identified but current CNO administration and FEMA came to an agreement to reopen this program. This is a “free” demolition for the property owner and no liens are placed on the property for the cost of demolition. The owner retains the lot.